Yoga, an ancient Indian practice once viewed as only for the very fit and flexible, has become as American an activity as jogging and aerobics. Its newfound popularity could be a boon for people with high blood pressure, heart failure, and other forms of cardiovascular disease. A small but promising body of research suggests that yoga's combination of stretching, gentle activity, breathing, and mindfulness may have special benefits for people with cardiovascular disease. The word "yoga" comes from a Sanskrit term that means union. It aims to join body, mind, and the day-to-day challenges of life into a unified experience rather than keep them separate. There are different forms of yoga, from the gentle, peaceful hatha yoga to the active "power" form called ashtanga. We focus here on hatha yoga because it is a good starting point. Hatha yoga's path to balancing the mind and the body involves three interconnected threads: physical postures called "asanas," controlled breathing, and calming the mind through relaxation and meditation. The three work together. How could this improve cardiovascular health? Getting into the various postures during a yoga session gently exercises the muscles. Anything that works your muscles is good for your heart and blood vessels. Activity also helps muscles become more sensitive to insulin, which is important for controlling blood sugar. The deep-breathing exercises help slow the breathing rate. Taking fewer but deeper breaths each minute temporarily lowers blood pressure and calms the sympathetic nervous system, which is responsible for generating stress hormones. The postures and deep breathing offer a kind of physical meditation that focuses and clears the mind. Meditation and the mindfulness of yoga have both been shown to help people with cardiovascular disease. Several randomized controlled trials under way should help pin down what yoga can — and can't — do for people with cardiovascular disease. Even if all of the trials provide unequivocal support for yoga, keep in mind that it won't offer magical protection against heart disease or a cure for it. Instead, yoga could be a useful method for coping with cardiovascular disease. Beginning yoga can be a challenge. Attending a general yoga class populated by fit 30-somethings who expect a good workout can be a disheartening introduction. If you are a few gray hairs beyond 30, look for a yoga class that includes the full package — poses, breathing, and meditation — rather than one that offers just exercise with a yoga bent to it. People with heart disease often have other health concerns, like arthritis or osteoporosis, that limit their flexibility. A good yoga instructor creates a safe environment for his or her students and helps them modify poses to meet their abilities and limitations. What can improve your mood, boost your ability to fend off infection, and lower your risk for heart disease, diabetes, high blood pressure, and colon cancer? The answer is regular exercise. It may seem too good to be true, but it's not. Hundreds of studies demonstrate that exercise helps you feel better and live longer. 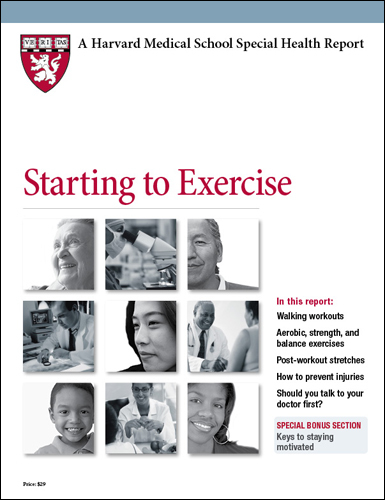 This report answers many important questions about physical activity. It will also help guide you through starting and maintaining an exercise program that suits your abilities and lifestyle. However, there is little evidence that it can build muscle bulk or strength in older adults like you. Some small studies have suggested that it might be helpful for those with a few diseases that afflict older people, such as heart failure and Parkinson's disease. — Anthony L. Komaroff, M.D.